This afternoon I found this robin's nest in the crab apple tree in front. 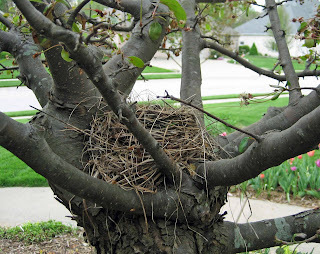 The bird who built this nest is pretty smart because it is in an ideal location. She was also a fast builder because this nest wasn't here a few days ago, or I'm not very observant. Now whenever I go out my front door, she'll fly off and sit on the edge of the roof and squawk at me until I leave the area. There are no eggs yet, but I'm sure it is just a matter of time. I'll leave the nest alone until all the birds have hatched and then remove it. I only had time to mow my grass today. My neighbor was mowing at the same time, with his riding mower. Just like last summer, he rounds the corner at the property line and scrapes the grass there, in my yard, down to bare ground. I'm not going to worry about it because they do keep their yard looking nice and are nice people. Besides, it's in the strip between the sidewalk and street, and it is just grass. I also saw my sister's neighbor on his riding lawn mower when I was at her house in the morning. This particular neighbor is very nice and traveled around the world as a missionary before he retired. He always wear a white dress shirt and tie, even when he is mowing the grass. And this morning since it was still a little chilly outside, he also wore his suit coat. I'm not making this up. He was mowing the grass in a suit. He always wears a dress shirt and tie. Always. Spring is starting to progress nicely here in central Indiana and in just a few days it will be May. May is a pretty exciting month around here, could you guess? In May, we transition from spring to summer and everything is very fast, both in the garden and around that race track in Speedway, "the racing capital of the world". 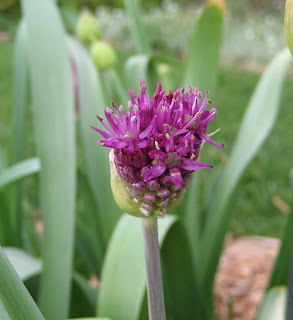 In just a few weeks, or sooner, we will say good bye to the tulips for another year and say hello to the next group of flowers, which includes these alliums that are starting to bloom. They will soon be joined be several other plants getting ready to bloom in a few weeks, including columbine, peonies, and lilacs. The whole month of May and Garden Bloggers' Bloom Day on May 15th should be pretty exciting here at May Dreams Gardens! Can a person stay fairly clean while using a riding mower? I have no experience, so I don't know how much effort it takes to mow with one, or if the grass gets thrown at the driver. I look forward to the next bloom day then. Lilacs and peonies---something we don't get to see here in Austin! Does he wear dress shoes too? I'm having a hard time picturing this, unless, as Annie speculates, a riding mower is a fairly clean experience! As the sister with the neighbor, I can vouch for what Carol has told you. Yes, he wears dress shoes as well. This gentleman is also in his 90's. I admire him. He still goes to work everyday (he works at a place that sends Missionaries all over the world), mows his own grass, suit, tie, dress shoes. FYI Carol, I've never seen him without a suit coat of some sort. Layanee... My profile picture? I forget about that sometimes. I took it from the cover of a 1906 seed catalog. It's my "anti-type" as I long ago stopped wearing dresses! Pam/digging... I just hope the lilacs and peonies cooperate and bloom at the right time! Lost Roses... per my sister, yes, he does wear dress shoes. 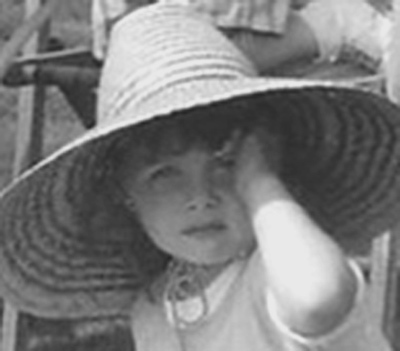 Sister with the Homestead...thanks for the additional information. He is a nice neighbor, but it must get hot in the summer with a suit coat, shirt, and tie on. Thanks for visiting next door! I appreciate your visit. I have been reading yours for a bit. I sometimes am Ginger! I can vouch for the fact that using a riding lawnmower is not very messy. The only time you might get grass on you is if it is very windy. I'll be getting mine out later today. Is this the neighbor to the north of Mom? How nice that you have a robin nesting in your crab apple tree. Hopefully there will be cute little baby birdies soon!